The arrest of WikiLeaks founder Julian Assange and the charges against him can be only a ploy to extradite him to the United States, BMS Law Firm Partner Alexei Gavrishev told Kommersant. “Since the British authorities made it clear as day not to extradite him to a country where he could face the death penalty, relatively mild charges were pressed. However, once he is extradited, he could be charged with espionage, for example, as some in the US suggested, and the journalist could even face capital punishment," he explained. 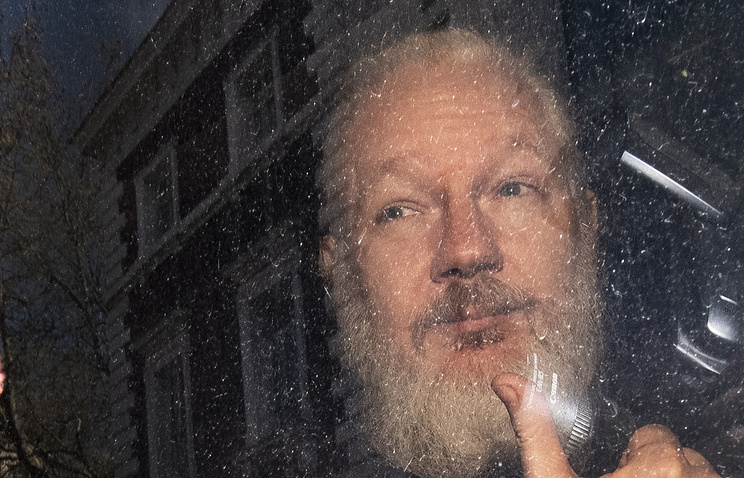 Assange’s arrest by London police is likely to end in his extradition to the United States, Izvestia quotes Chairman of the Russian Federation Council (upper house) Foreign Affairs Committee Konstantin Kosachev as saying. "Now we will see the British and Swedish authorities trying to pretend that there are no political implications in his case whatsoever. I do not envy those lawyers who will have to prove that black is white and white is black," he stressed. According to the senator, the issue at hand is not just punishing Assange. That should be a lesson for all those willing to shed light on the truth. So retaliation against the journalist is a fundamental issue for the Americans, he added. Meanwhile, Anatoly Kucherena, Defense Attorney for NSA whistleblower Edward Snowden, told Izvestia that Julian Assange’s arrest was politically motivated and sought-after by the Americans. "It is as clear as daylight that the Americans have been persecuting Assange for many years cynically and impudently," he said. A US court earlier charged Assange with computer hacking conspiracy, which means that he could face up to five years behind bars. That was done in the wake of his arrest by London police. Later on, the US Department of Justice confirmed that the journalist had been arrested under a US-British extradition treaty. Sudanese President Omar al-Bashir who was ousted in a military coup after being in power for three decades was the second leader in the region who stepped down recently amid widespread anti-government protests, Nezavisimaya Gazeta writes. Prior to that, Algeria’s President Abdelaziz Bouteflika had to resign amid mounting social unrest in his country. Sudan is an important country for Russian interests in Africa, Sergei Kostelyanets, Head of the Center for Sociological and Political Sciences Studies at the Russian Academy of Science’ Institute for African Studies, told the paper. "We have very close political stances on many international issues. We supported Sudan on the situation in the rebellious province of Darfur. For its part, Sudan voted for us twice at the UN General Assembly meetings on Crimea. In 2014, Sudan was one of two African nations that backed Moscow," he stressed. The expert won’t make any bets on how the situation will unfold in the future. "There are certain risks, of course, like in any regime change. For objective economic reasons, Sudan needs to establish cooperation with the IMF, the World Bank, and these organizations are largely controlled by Western powers. Therefore, a certain shift towards the West, at least on the rhetoric level, can be expected," he said when asked how the coup could affect ties with Russia. According to Kotstelyanets, Khartoum is Moscow’s foothold in the region. "It is important not only in itself. It is a springboard for further penetration into Africa. Currently, we have certain positions in the Central African Republic, and Sudan was a transportation link," he noted. Meanwhile, Andrei Korotayev, a Leading Research Fellow at the Higher School of Economics, believes Sudan’s regime change stems from domestic factors, primarily, economic difficulties. According to the expert, the external situation is fairly favorable for Sudan, with a sufficiently large number of regional players, including Saudi Arabia, interested in the stabilization of the situation in the country. In its Vision 2030 strategy, Riyadh prioritizes the Red Sea basin, having invested heavily in its stabilization. 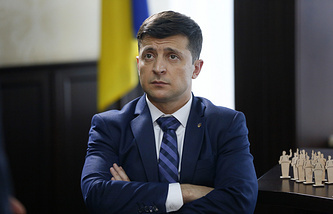 Ukrainian presidential contender, comedian Vladimir Zelensky, is way ahead of his rival, incumbent head of state Pyotr Poroshenko, RBC writes citing the results of a recent survey conducted by the Rating Sociological Group. According to the poll, 61% of those polled are ready to vote for Zelensky, while 24% others said they would back Poroshenko. Sociologists also found out that Zelensky had surpassed Poroshenko in all age groups. He also is the frontrunner in the country’s eastern, southern and central regions, while in western Ukraine the two candidates’ ratings are almost equal. The fact that Zelensky’s chances of being elected are very high was understandable even after the results of the latest survey were published, Ukrainian political scientist Ruslan Bortnik told the paper. "Among the factors that can prevent the comedian from winning are an extremely low voter turnout and a total failure in the last days of the campaign. However, it is impossible to say now what kind of failure this has to be to make him lose his lead," the expert said. Even the cancellation of the announced debate at the stadium could barely harm Zelensky, since he would be able to provide a convincing explanation, Bortnik added. According to Mikhail Pogrebinsky, Director of the Kiev-based Center for Political Studies and Conflict Management, entering into the debate is a risky step for both candidates right now. However, Poroshenko has one lever in his favor, he could muster up a large number of his supporters who would heckle Zelensky and prevent him from speaking, given that the comic has almost no political experience. However, the specific feature of a public debate is that it is a demonstration of resourcefulness, and Zelensky is on a par with the incumbent president in this regard. Besides, he could prepare a series of answers in advance. That said, the course of the debate and its outcome will depend on the atmosphere, and everything is very uncertain so far, Pogrebinsky added. 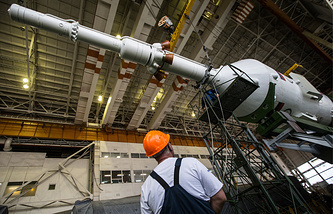 Work to design a plant that would assemble and test satellites has been completed, the enterprise is to be located in the city of Shchyolkovo, in the Moscow Region, and manufacture the first satellite by 2022-2023, Vedomosti writes citing data provided by Gazprom Space Systems. "The assembly and testing of a satellite would make up 3-5% of its total cost. To pay off the investment in the plant within the next 10 or 15 years, it has to assembly 4-6 standard large satellites per year. Fourteen satellites will not be enough for Gazprom to recoup the investment," the paper quotes a top manager from a space industry company as saying. "Building a plant to assemble satellites for a single consumer is irrational. The plant, which is under construction, counts on receiving external orders as well. The Roscosmos State Space Corporation and we are working on the issue," Igor Kot, Deputy Director General of Gazprom Space Systems, informed the paper. There are no steady agreements between the plant and Roscosmos, while the space corporation has its own satellite manufacturers, such as the Energia Rocket and Space Corporation, said a source close to Gazprom Space Systems. "When drawing up plans to implement up-and-coming programs, Roscosmos plans to take into account Gazprom Space Systems’ capabilities for the future in terms of production of spacecraft and multi-satellite orbit groups," a spokesman for the space corporation said. Any spaceflight is a feat, so it will never be a routine job, Hero of Russia Sergei Zalyotin, who travelled to outer space twice as Soyuz spacecraft commander, said in an interview with Izvestia published on April 12 celebrated as Cosmonautics Day in Russia. Today Zalyotin serves as an advisor to the head of the Russian Cosmonaut Training Center. "What is a spaceflight? It is 8 kilometers per second, 28,000 kilometers per hour. It is overloads, which far from what every person can handle. It is a huge risk when you are in a vacuum at an enormous speed. Even planes are not a routine matter," he said. Commenting on the issue of space tourism, he noted that today "cosmonautics is the lot of professionals." "Even a wealthy person, if he is not obsessed with spaceflights, will never be able to travel to outer space," he stressed. When asked why few Russian women (compared to Europeans and Americans) flew to space he noted that there was a "specialization of labor" in the Shuttle program. "There is a commander, a pilot, science experts and specialists in certain areas. On the other hand, we expect a woman to act as a commander and a flight engineer so that they could substitute for each other," he said. Zalyotin added that the most difficult thing for him during his first spaceflight was getting used to weightlessness and the need to work on a tight schedule for a long time. "We have a saying that only fools are not afraid of anything. However, there is fear that paralyzes a person, and there is fear, which makes him act. Cosmonauts are those who are ready to act. The feeling of fear - within reasonable limits - stops a person from doing some foolish things," he pointed out.